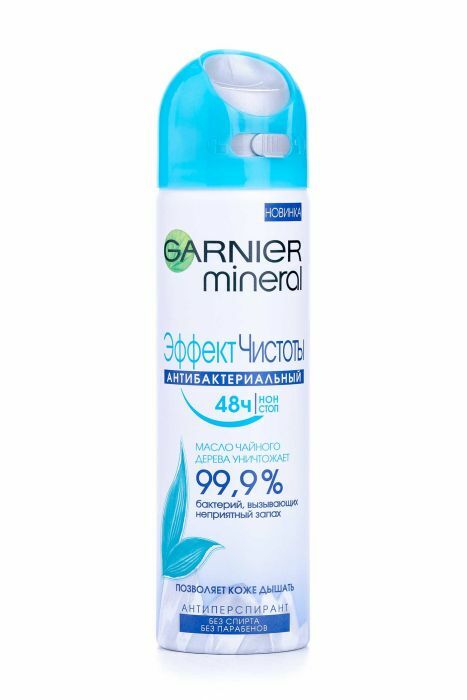 Garnier mineral deodorant-antiperspirant for body with antibacterial action is very good. I have used it and I like the product and how dry and natural it feels on my skin. It is enriched with minerals, perlite - a natural absorber of moisture. Protection 48 hours. Gives a pleasant aroma, a feeling of comfort and freshness. Active ingredients remove irritation, take care of the dryness of the skin, while allowing it to breathe and do not clog pores. This deodorant reliably controls the sweat glands, your skin remains smooth, healthy, velvety. 1.The aroma is very pleasant and lovely. 2. Keeps you dry and feeling fresh. 3 I danced and didn't sweat with the intense heat in the party. 5 Packaging is very cool but it looks more like a sports deodorant. 6 It has a lock on and off spray switch, which I think is very good. 7 Allows the skin to breath. Will I buy this product again? yes I will, I like the feel and it works for me. Shake the balloon before use. Dispense from a distance of 15 centimeters from the armpit. In the event of clogging, rinse the balloon and rinse the diffuser under hot water. Caution: attention! Extremely flammable aerosol! The cylinder is under pressure: it may explode when heated. Keep away from sources of heat, heated surfaces, sparks, open flames and other sources of ignition. Do not smoke when using. Do not spray on open flame or other sources of ignition. Do not smother or burn the balloon, even after use. Protect from direct sunlight. Do not heat above 50 ° C. Keep out of the reach of children. Avoid spraying into eyes and / or irritated skin, do not intentionally inhale. Use only by appointment. Do not use in a poorly ventilated room. Buy this product from Eva.